This book saves my bacon on a regular basis. 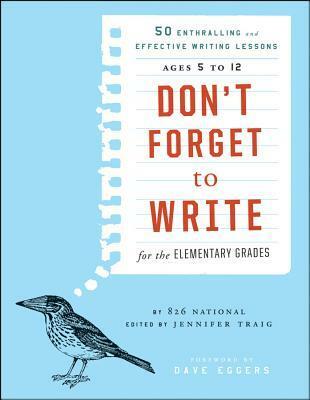 I cannot recommend it enough for teachers seeking to bring out kids' innate creativity and seeking to use literature as a powerful jumping off point for students' own creative writing. A light in the darkness. I really want to love this more, because I love what I understand 826 is hoping to do. Perhaps I am missing more activities that encourage connection with pieces of literature. The lessons here lean just a little more towards the photocopied fill-in-the-blank sheets, which doesn't seem quite fresh enough to me. Full disclosure: I wrote for this book. I love this already! Our multiple-times-a-day joint told stories are getting a little, well, stale and somewhat predictable so I was looking for a not too obviously coercive way to make them a bit more interesting. In looking through the lessons, I started laughing aloud, which made F ask what was so funny. I'd read him parts of the lessons and just in discussing some of the "writing lessons" from this book, he is already planning new stories. Who knows if they'll ever be written down. But, I have to imagine they'll improve. Some good ideas, but they skewed older than I wanted and included several repeats from the first book. Jennifer Traig - Jennifer Traig is a frequent contributor to McSweeney's and The Forward. She is the author of a series of young adult books and a humor book, JUDAIKITSCH. She has a Ph.D. in literature and lives in San Francisco.